Movies are created in the MOV format, which means you can play them on your computer using most video-playback programs. You also can view movies in Nikon ViewNX 2, the free software provided with your camera. 1Set the Mode dial on top of the camera to Auto. In this mode, the camera takes care of most movie settings for you, including ones that affect exposure and color. 2Set the lens to autofocus mode. Depending on your lens, you accomplish this by setting the lens switch to A, AF, or AF/M (auto with manual focus override). See your lens manual for help if you’re unsure. 3Engage Live View by rotating the Live View switch toward the back of the camera. The viewfinder goes dark, and your subject appears on the monitor. 4Press the Info button until the display is set to Show Movie Indicators view. At the default settings, your movie can be 20 minutes long, but that number presumes that your memory card has enough space on it to hold the entire movie. The maximum file size for a movie is 4GB (gigabytes). If the upper-left corner of the screen displays the letters REC with a slash through them, something is amiss: That’s the camera’s way of telling you that movie recording isn’t possible. You see this symbol if no memory card is inserted or the card is full, for example. 5Set the Focus mode to AF-S or AF-F.
AF-S: The camera locks focus when you press the shutter button halfway. 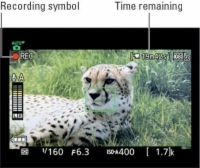 You then lift your finger off the shutter button; for movies, focus remains set at the current distance throughout your recording unless you press the button halfway again to reset focus. 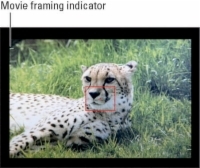 Choose this option if you expect your subject to remain the same distance from the camera throughout the movie—for example, if you’re recording a piano performance. AF-F: This setting produces full-time, continuous autofocusing, with the camera adjusting focus as your subject moves or you pan the camera to follow the action. Focusing starts immediately after you set the Focus mode to AF-F, and if you want to lock focus, you press the shutter button halfway. When you release the button, continuous autofocusing resumes. 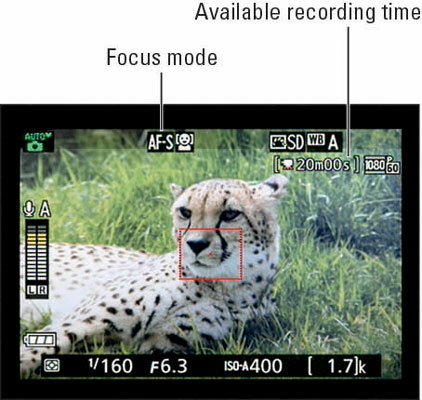 Although this option is best for tracking moving subjects, the built-in microphone sometimes picks up the sound of the focusing motor. To avoid this issue, you can attach an external microphone and place it far enough from the camera body that it can’t hear the focus motor. You can see the current Focus mode setting at the top of the monitor. To change the setting, use the control strip. Remember: Press the i button to bring up the control strip. 6Compose your initial shot in the monitor. The shaded areas at the top and bottom of the monitor indicate the boundaries of the default frame size, 1920 x 1080 pixels, which produces a 16:9 aspect ratio. 7If necessary, move the focusing frame over your subject. By default, the camera uses the Face-Priority AF-area mode, which means that if your scene contains a human face, the focusing system automatically focuses on that portion of the frame. In this scenario, you see a yellow focus frame over the face. When the scene contains more than one face, you see multiple frames; the one with the interior corner markings indicates the face chosen as the focus point. You can use the Multi Selector to move the frame over a different face. If the camera doesn’t detect a face, it instead uses the Wide Area AF-area mode, and the focus frame appears as a red rectangle. With AF-F focusing, you don’t need to do anything; just wait for the focusing frame to turn green, indicating that initial focus is set. With AF-S focusing, press the shutter button halfway. The focusing frame turns green when focus is achieved, and you can then take your finger off the shutter button, if you want. 9To begin recording, press the red movie-record button on top of the camera. Most shooting data disappears from the screen, and a red Rec symbol flashes in the upper-left corner. As recording progresses, the area labeled Time remaining shows you how many more minutes of video you can record. 10To stop recording, press the movie-record button again. Your movie is recorded to the memory card. Declutter the display by pressing the Info button. The display changes to the Hide Indicators display mode. In this mode, four white horizontal marks appear to indicate the 16:9 movie-framing area. Press Info again to display a grid. 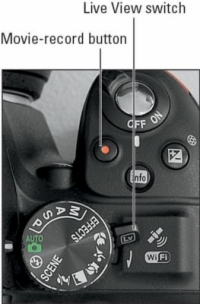 However, in these display modes, pressing the i button brings up the control strip for still photography. To view the movie version, you must use the Show Movie Indicators display. You can stop recording and capture a still image in one fell swoop. Just press and hold the shutter button until you hear the shutter release. The number found within the brackets in the lower-right corner of the screen indicates how many still photos you can fit in the empty card space if you stop recording. You can also save a single frame of your movie as a still photo.